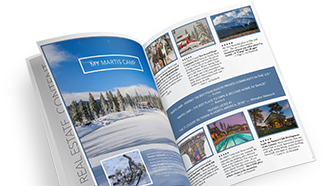 Martis Camp offers browser push-notifications to give our visitors a way of receiving real-time updates for real estate. Examples of these notifications include new property listings, price changes, special offers, and more. Push notifications are currently available for Chrome, Firefox, Opera, and Edge and Safari will be coming soon. Notification preferences are managed through your browser settings. You must opt in to receive the notifications when you first see the popup notification on this website. If you have previously declined or blocked notifications, then you will need to clear your site history and cookies in your browser settings to be able to opt in. If you previously blocked notifications, simply clear your browser history and cookies and you should see our pop up notification when you refresh this page. Notification preferences are based managed within your web browser. If you no longer wish to receive notifications, you can also reset your browser preferences to unsubscribe. Simply right click on a notification and follow the instructions to opt-out. Or click here for detailed instructions to reset your browser preferences and unsubscribe.